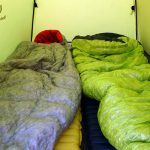 The Millet 7 Summits sleeping bag is a comfortable, warm bag with a great tapered design and excellent loft. The 7 Summits was the warmest of the bags tested in this category, but this warmth will cost you a bit more money. 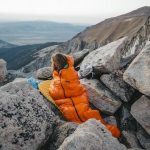 The Millet 7 Summits sleeping bag compresses well, especially given it has as much or more loft than any bag in this category. Millet provides a compression stuff sack for this bag which is always a nice feature. The 7 Summits uses 800-fill down, which provided excellent loft and no doubt contributed to it being the warmest bag in this category. The loft exceeded all other bags in this category also adding to better overall comfort. The Downtek treated down located in the bottom of the bag improved overall performance as it helped shed water and condensation. A large and comfortable hood and draft tube eliminated drafts and added to the warmth of the bag. 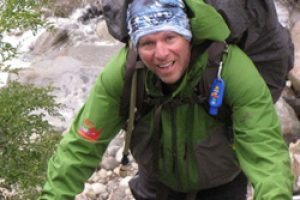 I found the 7 Summits comfortable into the lower 20’s, but had to add clothing when temperatures dipped into the high teens. Millet’s 7 Summits uses a composite 800 down fill and DownTek in the bottom of the bag to create both loft and weather protection. A large zipper draft tube and collar block the cold and add great overall comfort to this bag. The glow in the dark zipper pull was a nice feature for those middle of the night bathroom trips. The rip stop shell is water-repellent which adds additional durability and protection from the elements. A small Velcro pocket inside the bag proved handy for storing smaller items. I do wish the pocket was a little larger to store a camera, phone or larger items like that. Millet’s 7 Summits bag has a relaxed mummy shape and feel, but fits snug enough to minimize extra space, making the bag warmer than most others in this category. The fluffy down and large hood also provided extra comfort and a cozy feel. The 7 Summits bag held up well in a variety of conditions. The bag showed no signs of wear and tear and held up especially well to tent condensation, snow and damp conditions due to the DownTek down and water resistant nylon shell.